You can't say that about our Nell! An impulse-imp waving such a sign promptly popped into existence behind one of Raphael’s shoulders, but the little angel with a big hammer promptly knocked it out into the street to get trampled on. The shoulder-creatures looked embarrassed and went away as Marty locked down the energy-trickle from his aura. No wonder Kevin used his power so casually! Sometimes it was hard to keep it from just using YOU. Raphael, of course, saw that as perfectly normal! Now that robots could pass the turing test (unless you were REALLY CLEVER) you could never quite be sure! The machines might be rising up to take over the world, and people needed to be warned – if, of course, they WERE people and not infiltration machines! For a moment he saw a sentinel drone wearing a cheap mustache and glasses disguise sitting at the bar – but it was just an armadillo. Raphael had tried buying a round and starting to talk about local history in hopes of bringing out some information – but had to pour so much alcohol into everyone that his results were pretty general – and took a lot of analysis just to sort out from the incoherence, even when he got painfully obvious about what he was fishing for. Eventually he (well, OK – mostly Marty, afte a quick smartclothes briefing on what it was he was looking for) got them all started on reminiscing about the good old days of sailing before the Otters got such a stranglehold on the shipping market. Regular poaching by the Pirate Lord Henson had done a lot to keep any of the various trading houses from becoming too dominant. Marty had to laugh! That did tend to happen! The pirates of the – what, the “Salty Jerky”? really? – sounded more and more like his kind of businessmen! He set about steering the conversation towards piracy – and the “Salty Jerky”. A bit of background on the sailors who used to frequent the bar might come up as well – but things like that stuck in memory less than tales of pirate treasure! Raphael noted that it was important not to tell anyone about the items if they could help it; that way no one would try to raise the price if they had to buy the one they wanted! Marty was too used to working on an expense account to consider that his funds were pretty much unlimited now… He didn’t question the point. Well, that wasn’t exactly helpful. Kevin would probably be assigning Thralls to researching hibernation next. Anyway… Thanks to Marty’s social skills, barcrawling skills, and brawling skills, they soon learned that that particular band of pirates was originally a merchant company that ran into a number of debt issues – and had elected to use their ship to find alternate sources of revenue as opposed to selling the ship to settle the debt. Most of the crew – at least to start with – had been legal citizens of the city before becoming pirates and made a point of going after the merchant groups who were threatening to put the others out of business – both because those targets were more lucrative, and because of a sort of vigilante justice self-justification. They’d been very successful for a time, but had suddenly disappeared off the high seas about twenty years ago after a particularly fierce battle with the Otters resulted in significant damage to both sides. The pirates retreated and where never seen from again. Rumors that some of the pirates returned to the city to live quiet lives incognito were consistently dismissed as rumor given that most of them were well known wanted criminals and the fact that it would be hard to hide several ships worth of people suddenly entering the city. Well at least they knew what had happened – and that any survivors had likely just merged back into the population. Raphael, of course, was not hiding his pirate cove. 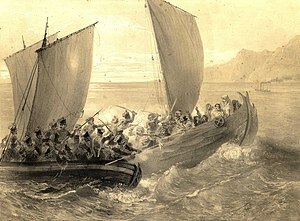 In fact, he was thinking of opening his own museum, gift shop, and second anchorage for the city… He cheerily filled in a few of the holes in the story – going over how they’d been attacked by their loot and how only a few had survived after hiding their ship in a cove connected to the city’s well. He even covered his “battle” and negotiation with the poor misunderstood and confused creatures that had killed off the pirate crews. Marty had rapidly determined that most of the local sailors worked either for the limited navy, the Otters, the Platypi, or the independent traders that visited the city every so often but were based elsewhere. Resentment of the Otters had been building for some time as they squeezed out all the local competition. Most of the sailors had either been joining the independent traders and leaving the city, joining other professions, selling out to the Otters, or drinking away their problems in the pubs and taverns near the docks. Well, that was about the picture they’d had of the otters. They were cute and cuddly – but they were also lightning-fast vicious little predators! Or at least they were if you looked like a fish. Come to think of it, he couldn’t recall having seen the Otter clan chief at that meeting with Kevin and the local “king” (perhaps it would be a more accurate translation to say “chief executive officer”?). Were they in denial about what was going on, or were they cutting their losses on getting involved in a personal argument with Kevin and himself? Admittedly that would be wise of them – but it would be a bit disappointing really! He’s respect them a lot more if they fought it out to the very last! Well, that did have a potentially way higher cost here than in Battling Business World. Still, they could fight it out until they were really in trouble before falling back! Er… They probably had some information on what had happened to the bandits too – and that gang had been nearly as large as some of the clans around here and way over-equipped. Well, a good try would do! [Raphael, Memoirs File 116a] “After many hours of stalemate with my magic and golems, we finally convinced them to talk to us – and then we heard the story of their lost eggs hidden so that even after years of searching they never found them. so I divined their location right then and there and sadly pointed them directly to them without considering to make the spell point the way through doors and open passages so they would not blow a hole in my ship.” -A segment from the middle of Raphaels overdramatized telling of the fate of the pirates and how he found the log that made him curious about the previous owners of his museum. Raphael made a note to find Miss Madalyn, check for restaurants that opened at the right time, and possibly check on exotic goods sellers in the area around the same time. Oh yes! And to go and see those monks! Kevin would probably just send a thousand thralls to bludgeon all clues into unconsciousness! Marty thought that one. If the Thralls could do that and have a hope of succeeding, that would be hysterical… He could just see them out chasing clues with butterfly nets and clubs now! Still, he was for visiting that monastery – and maybe finding Miss Madalyn after that. The monastery was a building high up on the mountain side overlooking the bay and the city below – although the enchanted cobblestones made it an easy hike. Raphael thought that it looked oddly… defensible for a religious institution. Oh dear! Were these going to turn out to be the local equivalent of Sith monks? Still, the place WAS surrounded by flowers and other pretty plants and he and Marty could smell the faint smell of almonds in the air as they approached the place. Wait, almonds? This wasn’t another ninja assassin monastery was it? He’d had quite enough of them on that trip to Japan! Practically on every damned streetcorner! Raphael thought that was an interesting idea! Breed almond trees in the exact opposite direction that they had been traditionally selected for to try to gather cyanide more easily! The local Thralls said… the place was highly disreputable, the guards were visiting all the time, and attempts to bring the entire place under arrest for tax fraud had been made, but had not gone well in the past. The monks were considered a public menace and the neighbors were complaining constantly about the smell and the noise. The “Ash” seemed to be blamed for a number of the problems. Oh dear! This time it was a classical Hashshashin sect! As best the Thralls knew, “ash” was an extract of a wheat type of plant grown in volcanic ash. It supposedly promoted a feeling of well-being, visions, contentment, and a complete disregard for social norms. A number of the nobility also held that it deadend the senses of fashion, dignity, and fine taste. Marty had taken several drugs like that back in his college days (and a lot of those memories were REALLY embarrassing now). He was prepared for anything though, so he headed in. Raphael was still going, but now he was kind of nervous about it… if they were using that stuff regularly it could be really weird in there. It all depended on how far it had gone in a closed environment and a tight social group. Marty thought about that… what was the worst they could do? Kill or drug them? He had ways of dealing with that sort of thing, and he was pretty sure that Limey had eaten a scroll of Remove Poison or Remove Hallucinogens somewhere on the way. They just walked up and knocked. They might react very weirdly to anything overly extravagant. Raphael let Marty lead; he felt safer with someone else is in front – and Marty WAS a toonworlder after all. Marty was fine with that! He’d used to do that with Gelman because he could take an angry refrigerator to the chest! Shortly a Raccoon wearing a loin cloth opened the door. A thick plume of smoke drifted out of the opening, and made their eyes water as they caught a whiff of the almond smell. The raccoon belched loudly and scratched himself. Marty described him – a male spider monkey, probably in his sixties, who always carried a notebook. Were they messing with him or were they just that high? Marty was betting on the latter. An older looking spider monkey came to the door. Gussey smacked the raccoon on the back of the head and pointed inside the house. The raccoon skulked off, muttering something about spider monkey ancestry. Raphael abruptly found himself tempted to say “Reeeeeeasearrrrch” and do a wise old sage routine – but that was probably just the smoke talking. (Raphael) “You do realize that does not sound nearly as good out here as it did in your head? that could sound like a death threat if you don’t know about the manifold. Marty was a bit startled to think of it that way! Was Kevin’s “just fling them off the deep end and get away while they’re floundering” routine rubbing off on him? Marty was worried for a moment – but then recalled that the only “person” who’d gotten killed was a relatively young phantasm – not exactly elder pirate material. Had the accountant who’d run away been a badger? Drat! That could have been him!